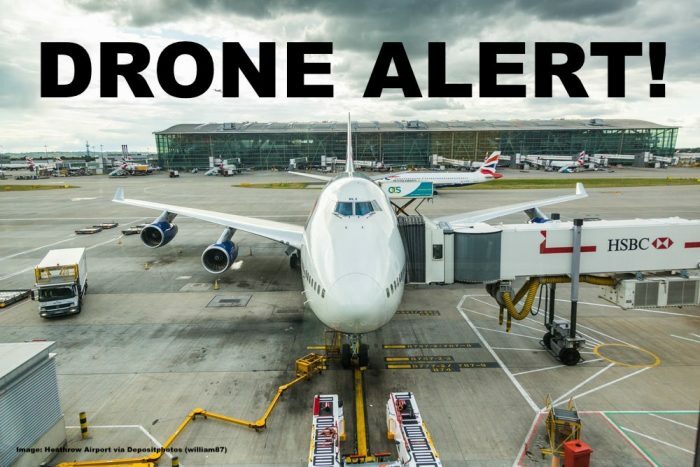 London-Heathrow airport flight operations were halted for an hour on Tuesday evening after reports of yet another drone sighting alerted authorities who decided to act and close the airport temporarily. The one hour suspension of operations caused major disruptions at Heathrow Airport though not as badly as in Gatwick several weeks ago. While the shutdown in Gatwick lasted several hours and happened multiple times, the situation at Heathrow was – at least this time – quickly resolved and after an hour operations were resumed. A BBC report (access here) says that airport operators are in communication with law enforcement and even the military. A Heathrow spokeswoman had said it was a “precautionary measure” to “prevent any threat to operational safety”. The spokeswoman said Heathrow was working with Air Traffic Control and the Metropolitan Police following the incident. 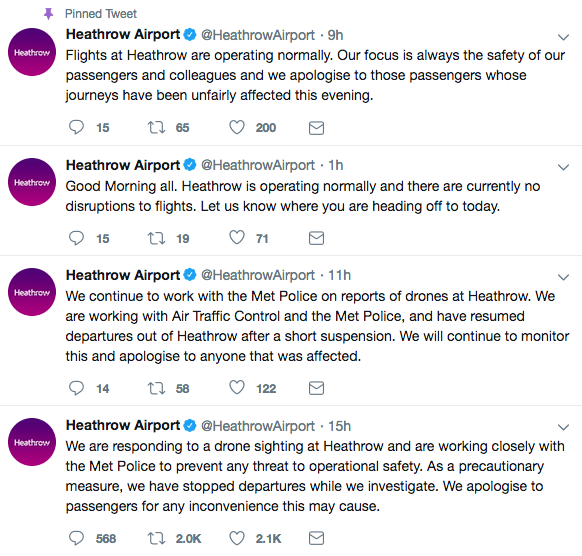 … The Metropolitan Police said they received reports of a drone sighting near Heathrow at about 17:05 GMT. Another article explains that UK Police will soon be given additional powers to deal with illegal drone operators and their toys. New legislation will give police additional powers to land drones and require users to produce the appropriate documentation. They will also be able to search premises and seize drones – including the electronic data stored within the device – where a serious offence has been committed and a warrant is secured. Meanwhile the Home Office will “begin to test and evaluate the safe use of a range of counter-drone technology in the UK”. That may well be the wisest way forward. But critics are likely to ask why such testing wasn’t already under way. After all, the threat was a known one, and it seems the Army at least had access to that kind of technology. The Gatwick incident happened at December 20th (we wrote about this here) and thousands of holiday travelers were affected. There are still has no new clues about the possible origin of drone activity that caused the shutdown of London-Gatwick Airport and it’s very easy for these devices to get away even if they were in fact hovering above airport grounds as reported. Authorities have to come up with a way to ensure a prompt follow up and a plan how to pursue drones and their owners. Having these cases continue with no viable suspects and prosecutions will just embolden more people to engage in similar conduct.